Well, our long journey is at an end (for now!). No new pictures, just some notes on how long the various bits are, should you want to add an SCT focuser to your GS (or just about anything else). For previous posts in this series, go here. Thanks, David! 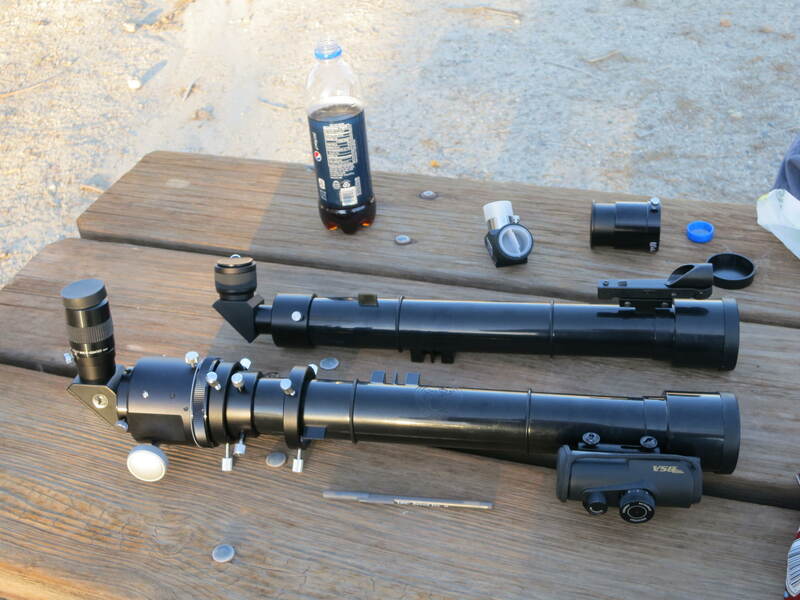 Yes, that is a 2-inch focuser on David’s Galileoscope. Why do you ask? Need to cut down 23mm, though 20mm might be enough. Could use a zero clearance 2″ – 1.25″ adapter or negative adapter (ScopeStuff) (negative won’t work, since the diag won’t slide into it). However……since not using the SV helical, there might be gain on the diag EP end. There were a LOT of intermediate steps that I went through before finding what works. If anyone wants more details about any of the steps, just ask. In fact, if anyone wants help with a conversion, walking you through it that is, just ask. I don’t have the time to actually do the mods (yet). Agena Astro is a good place to start for parts. First, the documentation on their web site is mostly complete and accurate. The few parts that didn’t have measurements, Manish and Tom measured for me and updated the web site. Scopestuff is another good site, and Tom was helpful in measuring parts AND has the capability to make custom parts – he made me a 2″ – 1.25″ adapter that truly added zero length to the visual train. Surplus Shed has some interesting parts that are cheap enough to experiment with. Their 2″ extender barrel has a 48mm thread and will mate to other adapters with that tread (but the part is a bit too long to be useful).